Accurate and versatile enough for the target shooter or hunter the Ember 1 and Ember 2 are the fastest, most accurate, easiest loading and best tuning releases on the market today. 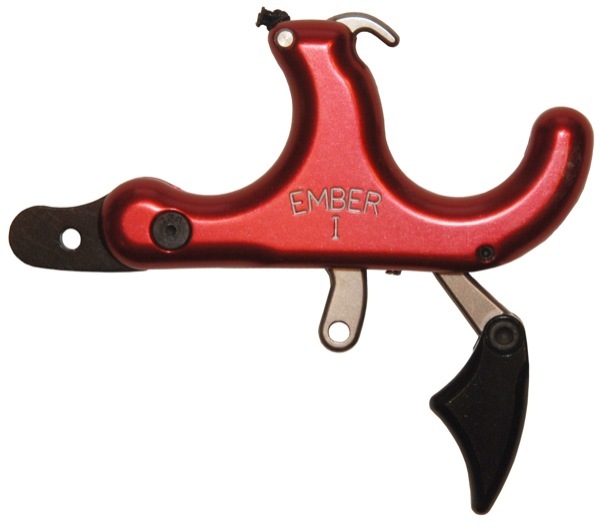 The Ember 1 and Ember 2 feature a handle design that is a half-inch shorter than previously designed hand-held release aids enabling the archer to shoot a half-inch longer draw and increase arrow speeds up to 5 fps. Both releases automatically reload the hook after firing, the open hook design is ideal for fast hunting situations. The Ember 1 and Ember 2 feature a newly designed version of the Interchangeable Tension System (I.T.S.) for quick and easy spring change. The modular designed handle allows each release to be shot as a two-finger thumb-trigger, as a 3-finger thumb-trigger, as a 4-finger thumb-trigger and, totally new, as a reversible ring-finger TRIGGER release.